The ideal shape for a multirotor ‘ducted-fan’ that can dramatically improve thrust and flight time. | Capolight Electronics Projects. 2018 update: User Wob Barley has built a working model of this duct based on David’s model (see update below) and done some tests which suggest an impressive 40% efficiency/40% thrust increases over open propellers. Here is a video of the test flight. A discussion of the work over on the rcgroups forum. 2016 update: David has produced a great customizable OpenSCAD file based on the study referenced in this post. The file can be found over at thingiverse here (thing:1535549). In a previous post I discussed how the addition of a well designed duct can reduce hovering power consumption of a rotor by over 60% or alternatively nearly double the thrust if power consumption is kept at the same level as the unducted rotor. These claims are based on a scientific study conducted on this very topic which can be found here (Mirror here) (Jason L. Pereira 2008). If you want to have a go at testing these claims for yourself then this post will hopefully give you an idea of what kind of shape that duct needs to be and also suggest some possible ways to construct it. Below is an cross-sectional view of a duct taken from the reference above. It outlines the critical parameters that affect performance: Diffuser included angle (θd), diffuser length (Ld), inlet lip radius ( r lip), blade tip clearance (δ tip). According to the study the optimal optimal configuration found experimentally includes a δtip = 0.1%Dt, rlip = 13%Dt, θd = 10◦ and Ld = 50% to 72%Dt. I have used sketchup to mockup what such a duct would look like for a 5″ rotor as seen below. Note that I went with Ld = 50% to try and keep the overall length to a minimum and also made it a single surface by using the inner wall only. The same duct can also be extended slightly for a contra-rotating setup and shown below. 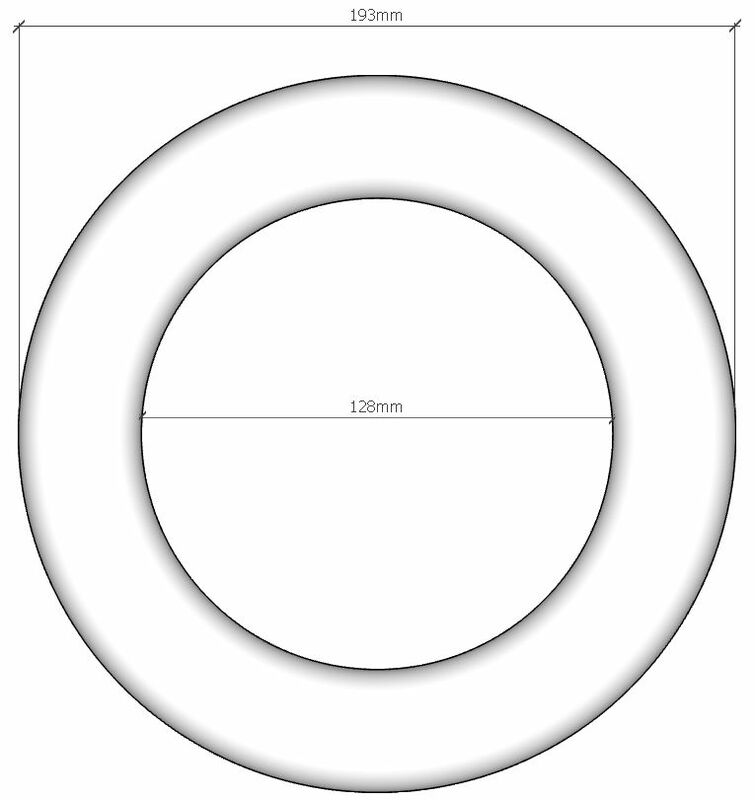 The dimensions for a single rotor duct are shown below (larger views available) for a 5″ rotor. Scale accordingly for a rotor of your choosing, but be sure to measure your rotor first as it may not be quite what you expect. You can find a copy of the sketchup model here. The most difficult part about making a duct for a multirotor will be keeping it light enough that you do not offset the respective gains. Thankfully, the literature suggests that when done correctly the additional thrust gained is so large (~90%) that you would need to nearly double the weight of your multirotor to cancel out the gains. Remember though, if you only want to bench test the thrust or efficiency improvements (as I hope to do eventually) then the duct can weigh whatever you want, it doesn’t matter. The following is a list of suggestions for how you could achieve a lightweight duct. Carbon fiber – The ideal solution: In an ideal world you would construct your duct out of a single piece of 0.5mm thick pre-impregnated vacuum bagged and autoclaved carbon fiber. If have access to this equipment then look no further. Fiberglass reinforced foam – The realistic option: A more DIY solution would be to purchase some styrofoam blocks and carve them into the desired shape. For added rigidity you could also layer fiberglass on the surface like you would for a RC boat hull or model plane wing. Cheapest possible or just for testing – If you just want to test out the idea then really anything will do the job, balsa wood, cardstock, old drink bottles, paper mache, gap filling foam etc. The most difficult part of the build would be getting the blade tip clearances as close as possible, as this has a big impact on efficiency but also requires very tight tolerances. One way around this problem is to build the duct quite roughly and then line the inside of the duct where the rotor will be placed with a material that can be scraped away by the rotor as it turns. Something like expanding gap filling foam may be perfect for this. Once the rotor scrapes away the excess foam you should be left with blade clearances measured in fractions of a millimeter. If you do end up trying something let me know as I would be really interested to see what you came up with and how you went. This entry was posted in Multirotor Projects and tagged build, design, dimensions, duct, ducted, how to, multicopter, multirotor, quadcopter, shape, shroud. Bookmark the permalink. 43 Responses to The ideal shape for a multirotor ‘ducted-fan’ that can dramatically improve thrust and flight time. Richard, I actually am 3d printing PET/Tglaze Plastic. Its commonly used in Soda Bottles. I find in incredible tough, and its perfect to print your ideal shape, and also include motor mount as well. Let me know if you want to work togeather to do this. As I can help u get them printed. Thanks for the offer, I may just take you up on that. I will be in touch. Another solution would be to use the Styrofoam block as a “lost shape” (sorry, I don’t know the exact term in English). You carve the Styrofoam block to the desired shape, then use it as a support for fiberglass or carbon and epoxy resin. Once the resin as fully polymerised, you can dissolve the Styrofoam shape using acetone. By lost shape.. you mean a “negative mold”. Good idea! I see a lot of benefits using this kind of design even in air, since we get δtip down to 0. And we risc no wear due to very small tolerances between the duct and the propeller. Since we get a multipole design we will get much more torque so we can keep the inductors in the motor extremely small an light weight. The only issue can be to get the speed of the motor high enough, but it shall be possible with a customized driver. It also gives the benefit of extremely accurate control of the rpm. What an interesting idea! Are you aware of any studies that have applied this technology to propellers for aircraft? I can see why this design would have many benefits for watercraft where weight is not critical. However, for aircraft the biggest challenge with this design would be overcoming the weight penalty that comes from using the shroud as the stator. It would be necessary to scale up the rotor diameter considerably for it to be effectively in air and I suspect that this design would quickly become impractical without becoming overly heavy. You could increase the rotational speed and have very high propeller loading to try and overcome this to some extent but I suspect this will come with its own efficiency drawbacks. I have no formal education in aerospace engineering so I am definitely not the right person to comment on this though. One area I do have some knowledge in is that of brushless motor design. Typically when constructing a brushless electric motor for use at high rotational speeds you try and maintain a rotor diameter as small as possible. This is because the centrifugal forces placed on the rotor at high speeds are enormous. For an electric motor ‘rotor’ that is the size of a conventional aeroplane propeller as needed for this design the maximum rotational speed would be severely limited by the strength of the materials it could be constructed from. For comparison consider the amount of engineering that goes into fabricating turbine blades that need to operate at high speed. Once you attempt to add the bearing surface, permanent magnets and magnetic core material as well into those blades it becomes a near impossible challenge. Thats not to say it couldn’t be done on a much smaller scale, such as for hobby sizes RC planes. Its just a question of if the advantages outweigh the drawbacks. Its an interesting questions and something I will no doubt give some more thought! Nice post, it is just what I need! Just a question: on the double rotor design, what is the optimal Ld for both propellers? I don’t understand why the top propeller is not in the same position as the one in the single rotor design. I’ve been thinking about the advantages of this design myself. One advantage it has over the ducted fan with a motor is that the moment arm of the motor and the turbine are one and the same rather than having a much smaller “crank” of the motor turning a much larger rotor. I think you are saying the same thing in different words. δtip = 0.1%Dt Damned ! this is so short clearance ! Have you any data or source about the increasing clearance effect on efficiency ? I’m shure that I can never get this as so close because propeller are really cheap. In fact grinding a smooth material with the propeller is the key. I’ll try. Did you perform real life tests on customer multirotor applications like on DJI machines or similar? I have two guys from Chalmers working on a Xjobb and I think that ducted propellers could be very beneficial for their application. Looks great! I can’t add much more than that as it has been quite some time since I have looked into this topic. Hopefully someone can use your 3d model to produce some parts and do some real word testing. It could be worth trying to bring this to the attention of group like these guys to see what they can do with it. Anyway, I will quickly update my post on the topic to include a link to you work. This is the most well thought diagram I ever seen for a ducted fan. I’m definitely going to test this out because I’ve seen unsuccessful attempts everywhere. So my question is, is there an ideal prop for this concept? I would assume a 2-bladed blunt tipped prop would get an enormous amount of thrust. Normally the blunt tip would create turbulence, however the duct may do away with that. Is that feasible? In case you’re not already aware of it, see Andy Shen’s ducted quad design based on this work at http://www.shendrones.com/liberty-ducted-quad. No I wasn’t aware, thanks for pointing that out! Excellent article that finally has some of the practical information I need on dimensions and how to build this. How does this kind of ducting impact on blade design? Surely bullnose type props will be preferable since the ducting mitigates the issues associated with tip vortices? Yes, I believe the closer the tollarence between the blade and the duct the better (think turbofan). From memory the paper referenced in the post has more details so maybe take a look there as well. The ducted fan has great thrust advantages over an open blade system. The big thing you have to look out for (and the reason you don’t see them in VSTOL aircraft) is the transition between vertical flight and horizontal flight. You will stall the blades on the leading side of the ducts as the air moves over the ducts. This stall causes the engines to loose lift and controllability. Maybe on a small drone with lots of excess power this won’t be as big of a problem but in normal aircraft this issue has cost lives. Where the bottom begins to widen – does this need to account for the height of the propeller? Should you basically design a straight cylinder from the top of the propeller to the bottom of the propeller and then begin the widening after the bottom of the prop? Or should the widening just begin at the top edge of the prop regardless of prop height (i.e. immediately after the inner lip of the duct)? This would mean that by the bottom of the propeller, the prop tip would be slightly farther away from the duct edge. The image with the dual motors setup implies that the ducts walls should be straight for the height of the prop … Trying to design a micro quad with at least a portion of this design. I’m not sure it will really help all that much as I’ll need to clip a lot of the duct away. Using the full duct would basically quadruple the weight of the quad. But I’d still like to get as close as possible. Is there any guide on the best shape design to hold the motor in position ? Does it matter if you are using a 2 or 3 blade prop? yep, I think it matter, assuming the duct reduce drain at poppeler end, adding one should add lift, it should add a bit current consumption too. 2, 3 then 4 blade could be nice. more should drain more power than adding something positive. this need a try ! I will definitely need to put this on my list of things to 3D print and try out. Also, I’ve done high power rocket fins to precise aerodynamic shapes using a 3D printer to print the mold for the airfoil. The construct is then layed up in the mold with carbon fiber and fiberglass to achieve very low weight and very precise surfaces. I’m sure this can work with such a mold also. I’m designing a 3″ quad and would like to use ducts, after watching a few videos (https://www.youtube.com/watch?v=Cew5JF8q6eY and https://www.youtube.com/watch?v=0stl1U9evzU&t=6s) on ducts I am unsure how stong the negative effect of using the annular wing is on multirotors where the axis upon which the motors lie are different and also the size. I can imagine it causing something like light flexing to instability, if anything at all. This would help me in designing my frame a lot, but maybe you do not know either. 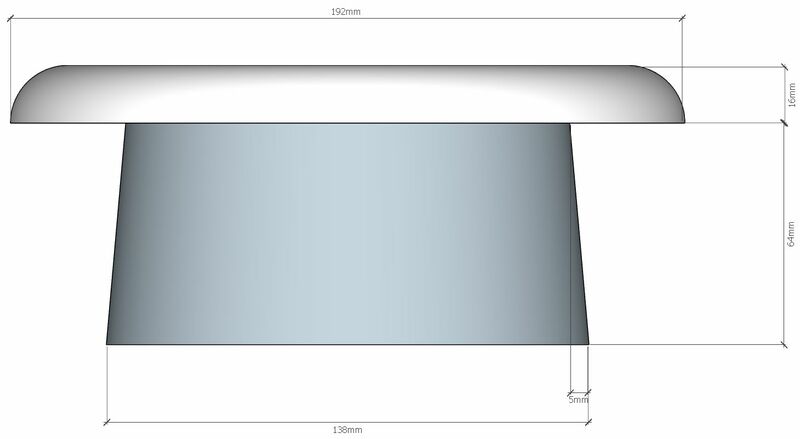 I so I will try to make two frames one with and one without an annular wing on top of the duct and compare (I am somewhat unwilling to do this as my budget is tight but think it is more worth it then investing in some overpriced motors). They thats great. Thanks for that! Richard — great stuff here. I’d like to chat offline. Can/would you please contact me at my email address, kent.tiffany@uxsolutionsinc.com. After intro on email, I would like to talk with you on what I’m trying to do. I’m curious about the plan to make the duct single-surface. When a fan is exerting static thrust, as you know, there is no free stream – there is only inflow and outflow, and some of the inflow on the outside of the duct is reversed – that is, air particles near the duct on the outside actually go forward, then pass the duct lips, go through the fan and are driven backward. With a single surface duct, those particles do not see a clear flow path. Have you tested this configuration? Who can point me in the right direction to find the best shroud parameters for axial (forward) flight? I’m really disgusted about them. I hope that you will stop them in time. I am finding difficulties in fixing the propeller as the clearance is very less. More over the propeller length is getting shorter while it touches the duct of glass fiber epoxy. Could you help me with the technique of fixing the motor and propeller. Thanks, Richard for the article and David for the cad file. Last summer I had been experimenting and having great success with hollow 3d printed ducts for a small brushless multirotor test platform with this article as inspiration and information. To keep the overall height within practical limits for a small copter, I clipped the height down to about 60%. Despite clipping them they still function really well. After printing and sealing, the hollow ducts are injected with 2 part polyurethane foam and it has resulted in amazing strength and in bench tests showed nearly 40% efficiency/40% thrust increases over open propellers, and due to my loose tolerances this is not anywhere near the δtip = 0.1%Dt formula. In a nutshell, these little ducts are outperforming their added weight to the aircraft by a strong margin. The added bonus is no more broken propellers nor getting an eye poked out. I’m now scaling up to 3 and 5 inch propellers in other aircraft. Just thought I’d share since this article confirmed what I needed to know to get started so you made it easy, especially with that cad file. The hard part was making them super lightweight but still strong. Thanks again! 3d printing the ducts for small multi’s works well, as Shendrones demonstrates, too. Anyway, if you’re interested, here’s my short video: https://youtu.be/it2o1WRWHKQ and RCGroups thread: https://www.rcgroups.com/forums/showthread.php?2971472-23DT-the-3d-printed-Micro-130-with-true-ducts-Emax-BabyHawk-Gear There are also thingiverse links in the RCG thread, too, if anyone is interested. Hey thats awesome! I’m surprised you were able to make the ducts lightweight enough at that scale to still see an efficiency gain so well done indeed. 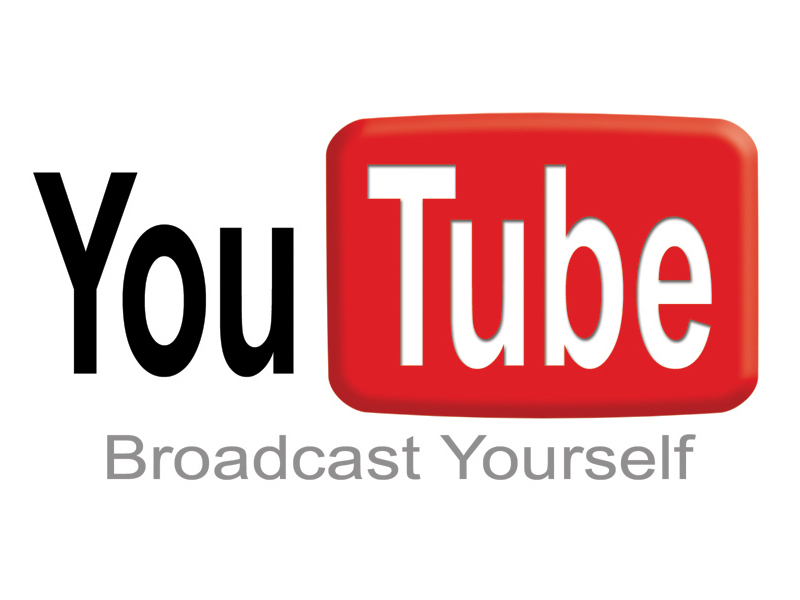 If you don’t mind I might add a link to your RC groups post and youtube video at the top of this post. Cheers! Richard — Of course I don’t mind 🙂 I just wish I had a better video of the blue copter thing. Perhaps later when I get time. Also, if you look at the RCG first post you can see a screenshot of the thrust numbers from my tests. Hey Wob, glad to hear of your results, it’s great that you’ve been able to put the file to a practical use and get decent results. I’m considering reworking the design to incorporate a few ideas I’ve had since posting the first iteration – one of which is to add the ability to incorporate internal struts as part of the print which will add further rigidity and strength with minimal weight gains which now sounds worthwhile given your testing. HI David, glad you like it, and thanks again for that file! Not sure if you mean struts on the inside of the duct structure or the motor mount struts. In my designs I have 4 to 6 tiny wing-shaped hollow struts for the motor mounts that are part of the single-file print, one of which is a little oversized to run the motor wires through. The foam does the rest and makes the thing strong enough to stand on, though at the 2.3″ propeller tiny scale they are so light that the foam is almost optional. I’ve found that 3-5″ prop larger ducts definitely need the foam it since they get quite squishy being printed in single-walls. Additionally, I found that most guys employing 3d printed ducts simply double-or-triple 3d print the general internal duct shape and do not go monocoque with it, but it’s that monocoque structure that makes them so strong. Finally, the slightly rounded outside structure helps lower horizontal wind resistance. for 3d print in order to use a bigger propeller. I would suggest using 3 wall printing in the inner ring, only 1 wall on the outer and filling volume with honeycomb structure (on z axis). I just can’t advise for the slicer witch can do it. Ishould insert it directly in the cad file for giving a good honeycomb orientation, avoiding slicer choose it randomly for me. I will give your project a follow. I like it. For better, smaller, clearance, I would try using a temporary bench with a gizmo motor and a ‘dremel’, machining the outer propeller diameter. easy to advice, not so easy to do probably. Thanks for posting my blue bomber up top! Just finished assembling version 2 in an orange PETG single-walled print. It has a 25% increase in flight time over a lighter weight unshrouded/unducted model with the same drive train. Motors are running cool as cucumbers. Nice and quiet and very enjoyable to fly. Thanks again, guys, for this blog post!